EmailBeautifier is the PUP that uses misleading techniques to prevent removal. Use Reimage to locate malicious components and get rid of them faster than with uninstall instructions. A full system scan blocks virus reappearance and prevents traffic to malicious domains. EmailBeautifier virus is a dangerous browser extension that computer users can install unknowingly. It suggests adding GIFs and background images to your emails. However, this extension falls into the potentially unwanted programs (PUP) category as it asks for extremely intrusive permissions and can possibly pose a threat to your privacy. The described extension is capable of controlling user’s microphone and camera, which clearly means that it can spy on you without your knowledge. 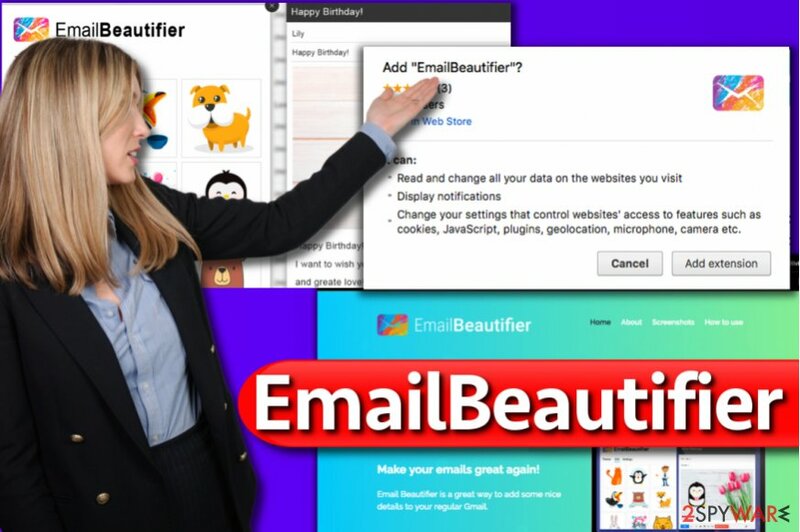 For this reason, we STRONGLY recommend you to remove EmailBeautifier from your browser using tutorial provided by 2-Spyware professionals (below the article). 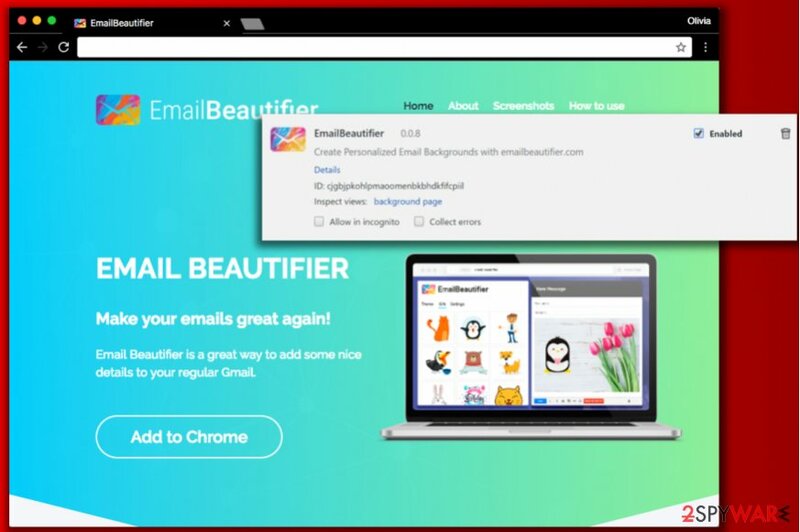 Also, to ensure that your computer gets cleaned from all spyware and malware type components, we recommend performing EmailBeautifier removal automatically. Even if you are sure that your computer is safe, you can check your system for free. We recommend using Reimage or Malwarebytes MalwarebytesCombo Cleaner software. Researcher shows what permissions EmailBeautifier virus wants to get before entering the victim's computer system. However, the user might not even know about installation of the extension in case it enters the system in a bundle with another free program. Besides, Usunwirusa.pl experts warn that the described browser extension might start initiating other aggressive activities such as display never-ending ads or change your browser’s settings to force you to use an unknown search engine that might be collecting all of your search queries and browsing history. In such situation, you might have to deal with EmailBeautifier New Tab problem. In short, the described browser add-on causes a variety of problems that should be avoided. To protect your privacy and prevent EmailBeautifier from causing you a headache, uninstall it from your device ASAP. Questionable programs that pose a threat to computer user’s privacy and cause problems such as pop-up ads or browser redirects can be installed alongside popular free programs. Therefore, it is important to monitor installation of any free program you decide to set up on your PC. After launching the installer of the program you downloaded, make sure to read legal documents provided by it. You might notice some suspicious statements about unknown programs that will be added to the system alongside your preferred software. If you can’t find any statements about extras, you shouldn’t relax that quickly. The next step is to check what statements hide behind installation settings. You should never rely on settings that are suggested to you automatically. Therefore, instead of picking Standard or Default option, choose Custom or Advanced instead. Picking these settings helps to see the list of programs that normally shouldn’t come with your chosen program. We suggest deselecting the additions as they can prevent you from using your computer by causing various problems. It is vital to clean your computer from rogue applications such as Email Beautifier. To completely remove EmailBeautifier virus and prevent it from tracking your online activities, use the tutorial provided below the article. The provided instructions explain how to get rid of this virtual threat manually. If you’re looking for a faster way to complete EmailBeautifier removal, consider using an anti-spyware or anti-malware software. You can choose one of the selections recommended by the 2-Spyware team. Open Control Panel and go to the list of programs that are currently installed on your computer. Get rid of the suspicious ones using the instructions provided below. Here, look for EmailBeautifier or any other recently installed suspicious programs. Wait until you see Applications folder and look for EmailBeautifier or any other suspicious programs on it. Now right click on every of such entries and select Move to Trash. Once these steps are finished, EmailBeautifier should be removed from your Microsoft Edge browser. Fix Chrome by deleting EmailBeautifier extension. We strongly recommend you to completely reset Google Chrome as well. Here, select EmailBeautifier and other malicious plugins and select trash icon to delete these entries. Click Reset to confirm this action and complete EmailBeautifier removal. Here, select Extensions and look for EmailBeautifier or other suspicious entries. Click on the Uninstall button to get rid each of them. Here, look at the Homepage field. If it was altered by EmailBeautifier, remove unwanted link and enter the one that you want to use for your searches. Remember to include the "http://" before typing in the address of the page. Now you will see a detailed dialog window filled with reset options. All of those options are usually checked, but you can specify which of them you want to reset. Click the Reset button to complete EmailBeautifier removal process. ^ UsunWirusa. UsunWirusa. Spyware and Security News, Malware Removal Guides. This entry was posted on 2017-09-15 at 08:09 and is filed under Stealing programs, Viruses. You can quickly scan the QR code with your mobile device and have EmailBeautifier virus manual removal instructions right in your pocket. How did you remove EmailBeautifier virus?